All My Movies is easy to use software designed to better manage and catalog your personal movie collection of DVDs, CDs, VHS tapes, etc ... As a serious movie collector, you might have hundreds of movies in your collection. All My Movies initially developed by Max Smirnoff (now Bolide Software CEO) for his personal usage, the software is published as shareware. As your collection grows, organizing your collection so that you always know whether you have a particular title gets more difficult. All My Movies delivers a fast way to organize your collection. Thanks to online movie databases such as IMDB.com, you will no longer need to type in all the details. Instead, you just enter the name or UPC barcode of your video or DVD/Blu-ray, and All My Movies will immediately retrieve everything else from the Internet. Use All My Movies program as your personal movie diary - store your impressions about every movie you've seen. Get a pretty organized watched movies list split by the month and year. Let All My Movies scan your hard drive and create your movie list automatically. You can download additional details about your movies, like cover image, cast, or synopsis. Finally, you'll get a great illustrated movie catalog where you can start the movie playback with a single mouse click. Reedem special All My Movies coupon code valid at Bolide store! 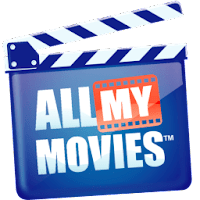 Disclaimer: Direct downloads for the lastest version of All My Movies 8.9.1452 are provided by the official software's author, we can't guarantee safety, availability or download speed. Moreover, we don't and we won't provide any pirated/illegal versions or tools. We recommend you to avoid it as these methods can harm your device. If you like the software, buy it to support the developers. (We provide software discounts for many worldwide brands).